Edgar Roy--an alleged serial killer held in a secure, fortress-like Federal Supermax facility-is awaiting trial. He faces almost certain conviction. Sean King and Michelle Maxwell are called in by Roy's attorney, Sean's old friend and mentor Ted Bergin, to help work the case. But their investigation is derailed before it begins--en route to their first meeting with Bergin, Sean and Michelle find him murdered. It is now up to them to ask the questions no one seems to want answered: Is Roy a killer? Who murdered Bergin? With help from some surprising allies, they continue to pursue the case. But the more they dig into Roy's past, the more they encounter obstacles, half-truths, dead-ends, false friends, and escalating threats from every direction. Their persistence puts them on a collision course with the highest levels of the government and the darkest corners of power. In a terrifying confrontation that will push Sean and Michelle to their limits, the duo may be permanently parted. 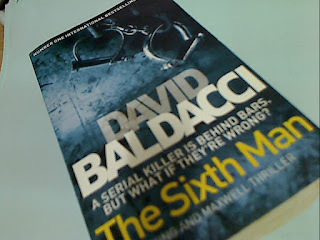 The Sixth Man by David Baldacci brings reader to his two well know and probably pretty well liked characters, King and Maxwell. I first met these two characters in another of David's title but I couldn't remember which title at this point. That said, I think I would remember this book in years to come (hopefully) as it was a pretty good read. The story is pretty thrilling and fast paced and I was pretty captivated by it especially since it was read during the recent long holidays that we had. As for the ending, I won't actually call it a twist but it was a good enough ending for for that I do recommend this to you if you're looking for a thriller.